Printed Cartons Market size was more than USD 124 billion in 2016 and will witness 5.3% growth over the projected timespan. Robust product demand from food & beverage industry primarily owing to rapid population pace in Asia Pacific is anticipated to make prominent contribution to printed cartons market size in the forecast spell. Progressively improving packaging standards in the region are attributed to strong R&D investment which has led to development of variety of machinery & equipment competent in variety of designs for packaging. In addition, rapidly growing cosmetics & personal care industry in the region which is due to rising socioeconomic factors will subsequently help attain promising gains in the printed cartons market size in the forecast span. Strong growth indicators in the electronic industry in North America which is credited to substantial investment in R&D to develop advanced equipment as per evolving consumer demand will drive printed cartons industry size during the forecast period. Electronic industry has been primarily utilizing corrugated printed cartons for storing and transportation owing to fragile nature of electronic devices. In addition, intense competition among major players to gain consumer’s attention has led to development of attractive packaging techniques which will help attain prominent printed cartons market size during the forecast span. Recent advancements in the digital printing techniques for printed cartons is priced comparatively higher to conventional printing methods which is likely to obstruct the overall industry size during the forecast period. However, rising product demand from several end-user industries including food & beverage, electronics, personal care, healthcare, etc. will generate plentiful opportunities which will help attain significant printed cartons market size in the coming years. Corrugated board market size attained the highest share and is likely to grow at a CAGR close to 5% during the forecast span. It is credited to prevailing application across electronic industry as it provides numerous advantages including shock resistance, protection against moisture and sustainable packaging solution. Corrugated printed carton are formed from a series of parallel ridges and grooves which are responsible for adding rigidity and strength to the carton. In addition, corrugated board application in printed cartons market has attained a major chunk owing to its highly customizable features and cost-effective nature which will drive the overall printed cartons market size in the near future. 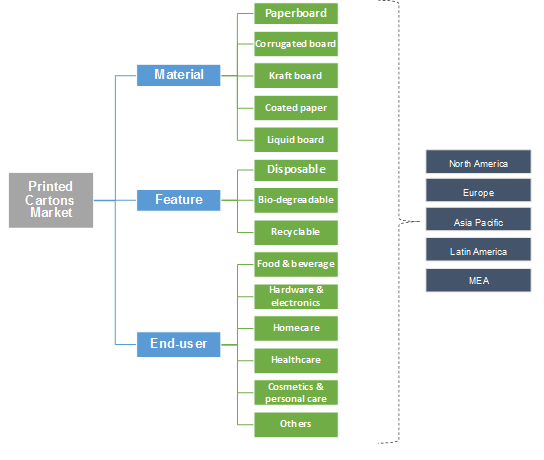 Kraft board market size is anticipated to rise at a CAGR close to 5% during the forecast period owing to its ability to provide high durability in packaging industry. It is extensively preferred for packaging heavy material after corrugated board packaging. Attractiveness and surface finish are of secondary importance in kraft board packaging as bleaching and gloss finish reduces strength. Availability of kraft board in variety of grades along with added-features including high strength, elevated and customizable elasticity, etc. makes it desirable across several end-user industries including food & beverage, healthcare, electronics, etc. which will subsequently help attain promising gains in the coming years. Printed cartons market size for recyclable cartons has attained major chunk of the overall industry share and is projected to grow at a CAGR close to 5% in the coming years. This is attributed to rapidly rising waste reduction techniques to attain environment sustainability as it will subsequently result in reducing deforestation. Government and regional bodies have been encouraging application of recyclable paperboard cartons for packaging across various end-user industries including food & beverage, electronics, healthcare, personal care, etc. which in turn will have positive impact on the recyclable printed cartons market size in the coming years. Printed cartons industry size for biodegradable cartons is projected to grow at a CAGR close to 5.5% in the coming years. They are capable of being broken down by the action of microorganisms via anaerobic or aerobic degradation. For instance, paper board and corrugated board cartons are made up of biodegradable substance including food waste, wool, wood, human and animal waste, etc. which is another methodology for reducing waste from the environment to attain sustainability. Printed cartons market size for food & beverage industry has attained a major chunk of the overall industry share and is anticipated to rise at a CAGR close to 5.5% in the coming years. This is credited to extensive applications of the product for storing and transporting food & beverage items which includes dairy products, frozen food, dry food, confectionary, alcoholic and non-alcoholic beverage. Beverage are usually packed in corrugated cartons as they have comparatively higher shock resistance. These cartons are fabricated using coated, laminated and puncture resistant stiff paper for effective strength and usability. Printed cartons market size for healthcare industry is predictable to grow at a CAGR close to 5% during the forecast period. It provides excellent packaging solution for medical drugs, devices and equipment for shipping or storage purpose. Healthcare industry primarily utilize paper & paperboard cartons to protect and transport medical drugs and products. However, the industry also utilizes varied thickness corrugated board cartons to store & transport medical devices and equipment which falls under the category of fragile items to avoid damage. Asia Pacific printed cartons market size is the fastest growing segment and is anticipated to grow at a CAGR of over 6% during the forecast period. Rapidly growing food & beverage, hardware & electronics, healthcare and cosmetic industry in the region, which is primarily due to rising consumer disposable income and henceforth propelling consumer spending power. It has resulted in rapid pace of market share, which are extensively used across aforementioned countries for shipping and storing applications. North America market size was valued over USD 30 billion in 2016. This is credited to strong growth indicators in food & beverage, hardware & electronics and healthcare industry. Substantial investment in the R&D has led to development of advanced electronic devices and equipment as per rapidly evolving consumer preferences which will help attain promising gains for printed cartons market size in the forecast span. Some of the prominent printed carton manufacturers are All Packaging Company, Amcor Ltd., Lithoflex Inc., Winston Packaging, WestRock Company and Tetra Pak International S.A. The industry has several small, medium and large-scale contributors having applications in food & beverage, electronics, personal care, healthcare and homecare industry. Key industry players are actively involved in forming strategic alliances to attain competitive advantage in the market. For instance, Amcor completed acquisition of Alusa, a flexible packaging company in South America in June 2016. The business has four plants, each one in Chile, Peru, Argentina and Columbia. With this transaction, the company can successfully cater to large multinational customer base in South America. Printed cartons are primarily used for shipping and storing applications across several end-user industries including food & beverage, hardware & electronics, homecare, healthcare and cosmetics & personal care. They vary in terms of thickness, size, color, etc. for extensive applications in the aforementioned industries. Several types of printed cartons are paperboard, corrugated board, kraft board, coated paper and liquid board. Furthermore, in terms of features, printed cartons are classified into disposable, biodegradable and recyclable. Sturdy growth in food & beverage industry which is attributed to rapid population pace in Asia Pacific is likely to make considerable contribution to printed cartons industry size in the coming years. 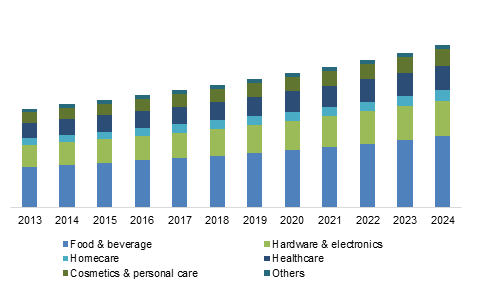 Furthermore, significant investment to R&D facilities in the healthcare sector to develop technically advanced devices and equipment will be a major influencing factor for printed cartons market size to store and transport medical devices in the coming years.